Healthy never tasted as good. 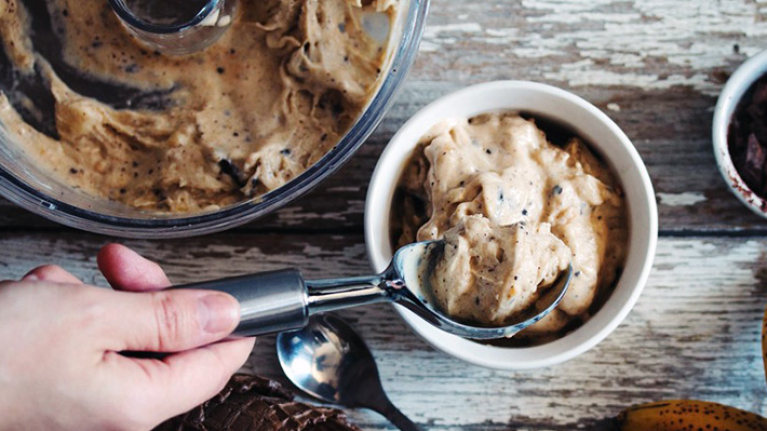 If ice cream if your go-to treat for summer, we think you need to know about this incredibly creamy, delicious and vegan version – which we are planning on making on repeat for the coming months. All you need are four little ingredients and a blender and you are good to go. Put all the frozen bananas, almond milk and 3 tablespoons of peanut butter into a blender and whizz together until smooth. This will take a while, keep scraping down the sides and separate any banana chunks that have become frozen together. Once smooth, remove the blender blade and stir in the chopped chocolate. Tip the ice cream into a freezer container dotting and swirling in the remaining peanut butter as you go, cover and freeze until set. Remove from the freezer 10 minutes before serving.